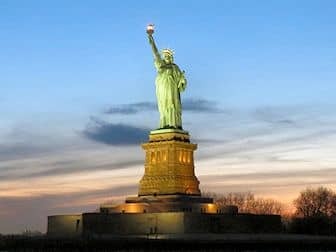 The Statue of Liberty is one of the best known symbols for New York. It symbolises political freedom and democracy. Located in New York Harbour, it is seen as the unofficial entrance to New York City and welcomes visitors from around the world. Given to the United States as a present from the people of France for the centennial of the American Revolution, the Statue of Liberty opened to the public in 1886. To visit the Statue of Liberty, you have to take a boat from Lower Manhattan. Before boarding the boat, everyone must go through a rigorous security screening, similar to one at the airport. A visit to the monument itself requires an additional screening. Please note that large bags, backpacks, strollers and other large items must be stored in lockers on the Liberty Island. You can rent a locker for a couple of dollars. 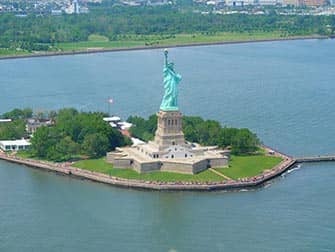 If you only want to visit the Statue of Liberty and Ellis Island, you can book your tickets for the ferry on this page. This is a safe and easy way, you don’t have to print tickets and can just show them on your phone. I would recommend however that you buy one of the discount passes to visit Liberty Island where the Statue of Liberty is on, the New York Pass, New York CityPASS and the Explorer Pass all include a visit to Liberty Island. The boat will take you first to Liberty Island where you will disembark and walk to the Statue of Liberty. When you are done with your visit on Liberty Island you can take any boat back that you want. The boat will always go first to Ellis Island, where you can disembark if you wish. You don’t have to pay anything extra for this visit. If you don’t want to visit Ellis Island, you stay on the boat and they will bring you back to Manhattan. 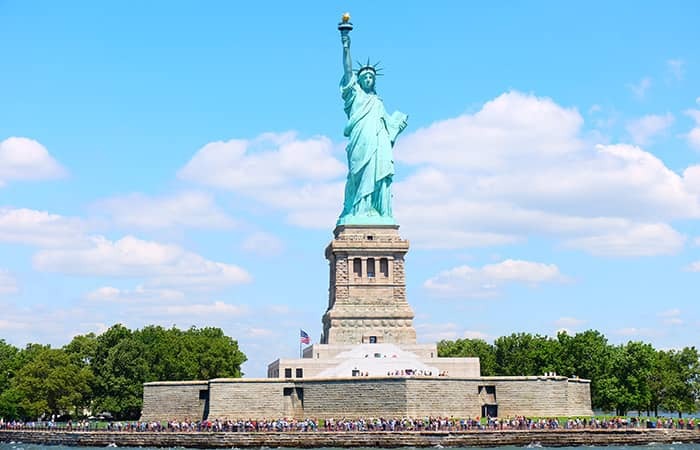 On this guided tour to Statue of Liberty and Ellis Island you meet at Castle Clinton in Battery Park and head to the ferry where you will be able to skip the line with priority boarding. Once on Liberty Island you will be able to visit the pedestal (ticket included). When you are done exploring, head back to the ferry and travel to Ellis Island. You are free to stay on Ellis Island as long as you wish. If this tour is sold out, see if the Statue of Liberty and 9/11 Memorial tour has availability. Can I go inside the Statue of Liberty? There are two ways you can go inside the Statue of Liberty: by visiting the pedestal or by visiting the crown. For both of these you need to reserve in advance as tickets sell out extremely quickly. There is an observation deck at the top of the pedestal. You get a close up of the Statue herself from here, plus a nice view of the Manhattan skyline. To get to this lookout point, you can climb the 215 steps or choose to take the lift for a portion of the climb. In the lobby of the pedestal you can also find the Liberty Island Museum. This tour includes a visit to the pedestal. If you want to also visit the crown check here for tickets. When making your reservation, make sure that the name on the ticket for Statue of Liberty is the same as on your passport. For walking up to the crown, it is 354 steps up and down a narrow staircase. If you are walking up to the crown, the only things that visitors are allowed to take with them are their ticket, camera, and medication. All other items, including wallets and keys, must be stored in a rental locker. Can I see the Statue of Liberty for free? Yes! Take a free ride on Staten Island Ferry. You will pass right by Statue of Liberty, but you cannot stop and get off at Liberty Island. Read more information on Staten Island Ferry here. Eric’s tip: If you have not pre-booked your ticket, personally I wouldn’t even head down to the harbour. The whole visit to the Statue of Liberty will take at least 5 hours. If you don’t want to spend that much time, why not take one of the many boat tours. You will cruise past the Statue of Liberty but also be able to see other sights.